Have you ever wished that you had an extra 100,000 miles on hand so you could get out of town? If you’re one of the five winners of American Airlines’ American Way magazine’s Road Warrior Contest, that’s exactly what you’ll get, along with a vacation in Belize and lots of other prizes. The contest runs until October 31. Enter by going here, filling out a survey and sharing a travel story. In November, the magazine will name five winners. 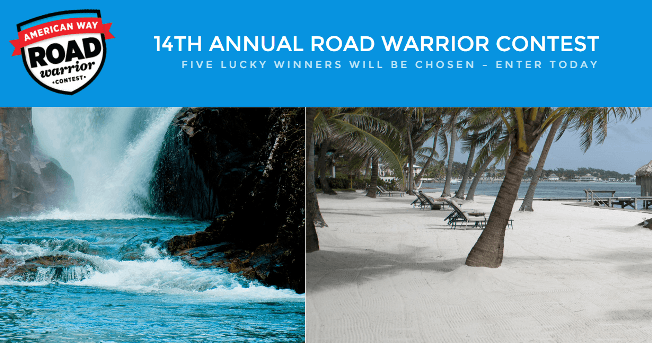 Road Warriors are always on the go, and this contest has been designed by the team at American Way to inspire people to think and write about the adventure in their lives. Once you fill out a survey, you can either pen a poem or write an essay telling the editors of the magazine about a travel adventure you’ve had. The vacation in Belize includes airfare, two nights at Victoria House on the beach and another two nights at the Ka’ana Resort, located in the jungle. The vacation is supplied by American Airlines. The winners can use their American Airlines AAdvantage miles for everything from airfare, vacation packages and hotels, to car rentals, retail merchandise and cabin upgrades.